I like both but ... if I do a one... I can not do the second!!! 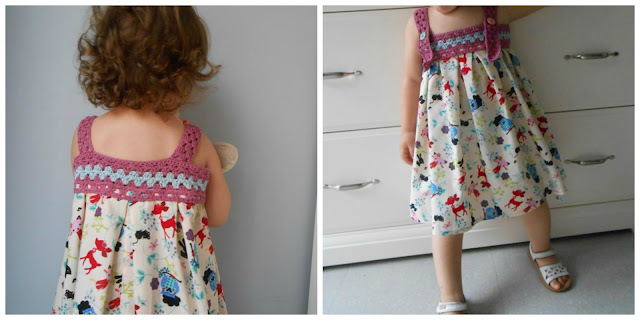 I have made two dresses for Carlota with combining fabric with crochet. I hope you like it! Come on! Both dresses are made of 100% cotton. Fabric and yarn. 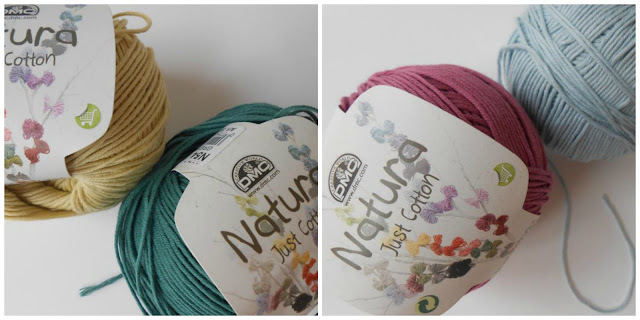 The yarn is DMC brand and is a delight! light and very soft to the touch! Ideal for clothing! This time I have worked with 3mm crochet hook and I think like this is going very well. I did not take measurements and ... it turned out to be huge!!! And I decide to put buttons so you can modify the dress size a little ... just in case! You will have noticed the disaster??? You see what difference in sizes!!!!!! The green is huge! huge! huuuuuuuuuuuuge!!!! However this crocheted fabric dress fits perfect! Today it has been premiered! And if for time cool a cotton shirt with short sleeves below looks very nice too! Yesterday I ended up sewing night, very late ... As always sleep late! And this morning after breakfast we have made photoshoot! 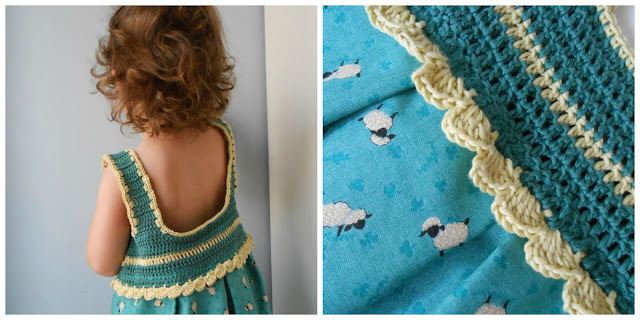 but... she liked crocheted fabric dress that have made her mom! could be a top for me...????????? shame!!! impossible!!! is not very polished idea but... I like my sewing machine! I confess that I enjoyed to make these two creations. Finally something I do for my daughter...! Enjoy! Take advantage of the summer holidays! Thanks for visit me in my world of wool and thanks for your comments! 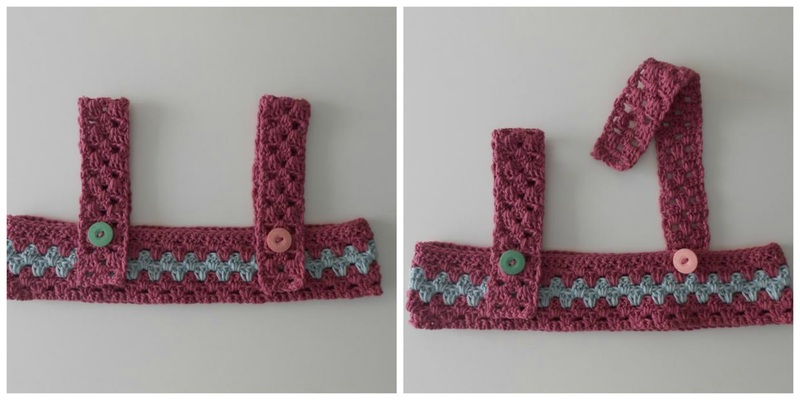 I have tried sewing machine with crochet items but it becomes too thick and doesn't sew smoothly. Is there any special technique that you follow? I can not follow any special technique to sew sew because I do not know sew! I just use the normal stitch ... I do not know if that can translate well into English ... You know, normal sewing items! I can not tell you anything ... I sew only "normal" on crochet ... 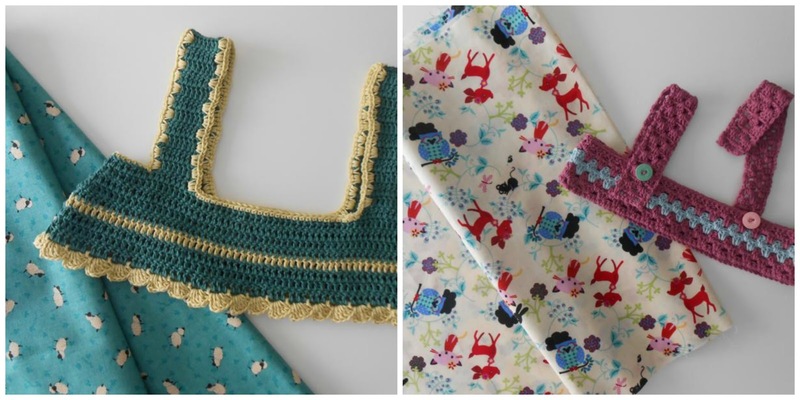 I spent three times above the crocheting with the sewing machine ... I it could be help you a bit with this? Thanks for visiting me! So wonderful that you design your own works and not follow patterns. I have tried patterns and they just don't work for me either. I start with an idea and then I let it flow from there; none of my quilts have a pattern or even a real idea of what they will be when finished. Organic - that's how I think of it, dynamic and ever-changing. 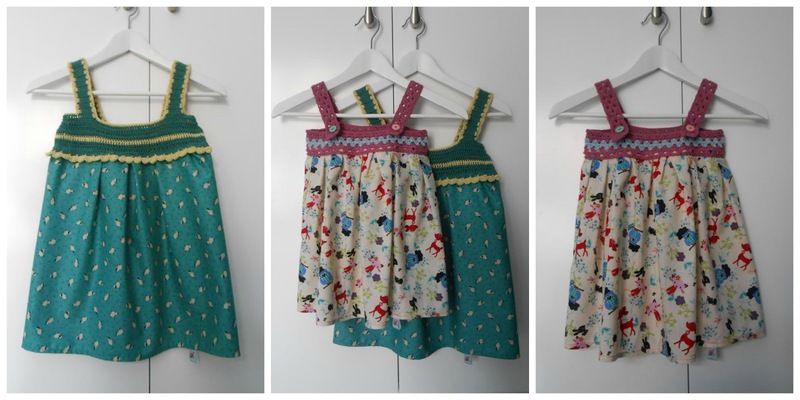 You did a superb job with these two little dresses for Baby Girl. This is absolutely gorgeous, I'm learning to crochet at the moment, it's not going so well, but I did work out what I was doing wrong! So that's a start right? I was just telling my mom the other day I would like to crochet edges on my pillow cases, and here I see your blog and you have gorgeous yarn on dresses! 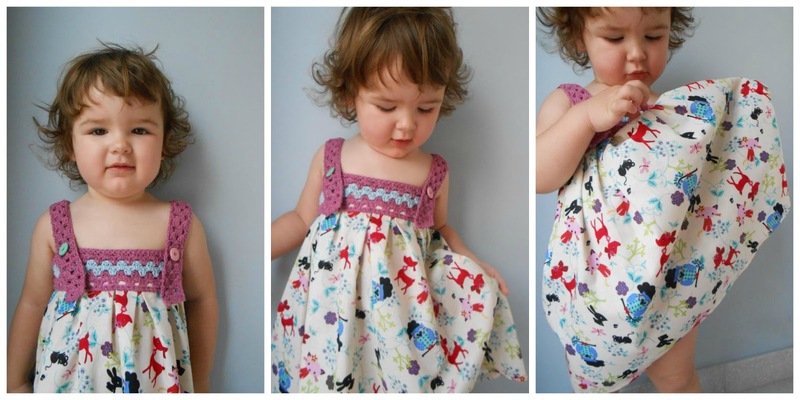 she is so cute in her new dresses!!!!! Per favor Cristina!!!! Són una preciositat, i la Carlota està moníssima!!! Quines galtes que té, per mossegar-la!!! Mira agafo en sentit positiu, ja tens roba per l'any que ve!! Quina forma tant espectacular de fusionar la passió del ganxet amb la costura! Nenaaaaaaaaaaaaaaaaaa! quina monada per favor!!!! m'encanten m'encanten!!! I les teles??? son una monada!! no les havia vist mai aquests estampats! d'on son??? Felicitats guapa! son preciosos els dos!! Cris!!!!! Són preciosooooooooooooos!!!!!!!! El verd li guardes per l'any que ve i ja està!!! M'encanteeeeeeeeeeeennnnnnnn, moooooooolt!!!!! Nena si envies les fotos als del blog del DMC segur que te les pengen! He vist que pengen coses que la gent fa amb els cotons natura ;) Felicitats guapa per aquestes labors tan, tan, tan boniques i creatives! Muacks!!!!!!! Super, super xulos! No sé quin dels dos m'agrada més. Fins i tot me'n faria un per mi. Jajajaja! Molts vestits així havia tingut jo de petita. La mama feia la part de ganxet i la iaia la de roba. Están bellisimos los dos vestidos!!! 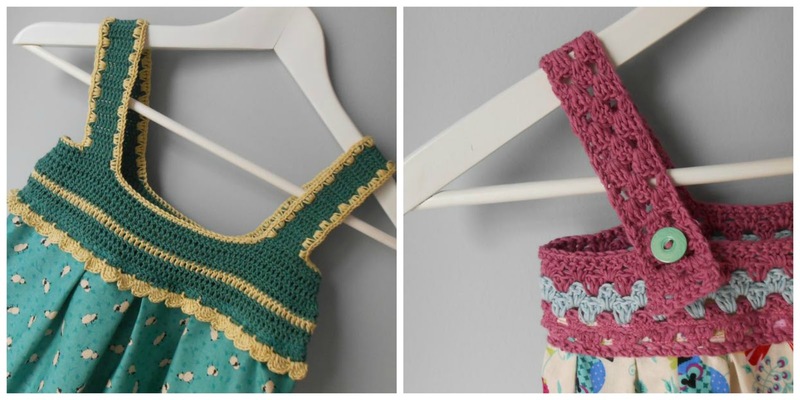 Tu hija se mira divina con esos vestidos de algodón, los cuales se ven muy frescos y perfectos para el verano. Cristina, la nena està preciosa amb aquests vestits, t'han quedat molt bonics, m'encanta la roba d'animalons. Uns vestits preciosos amb uns colors molt encertats !!!! Hola Cristina!! Quins vestits més bonics! He estat mirant el teu blog i fas unes coses genials!! Enhorabona!! Cristina! Quina xuladaaaaa! I la Carlota està preciosa sense pentinar! El vestit verd ja l'aprofitaràs ja...aquests vestits són ideals, si van a la mida són perfectes i quan es fan petits, serveixen de bluseta! L'any vinent lo quedarà perfecte! Podez escribir el patron de vestida?